Tucked in one corner of Bayfront Park is this metal pipe sculpture which I had always thought was some strange monument to DNA. Turns out I wasn't that far off. The sculpture is called the Challenger Memorial, in remembrance of the ill-fated NASA shuttle. 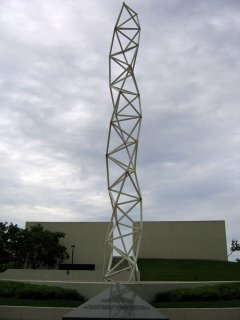 The sculpture is indeed meant to recall the double helix of the DNA molecule as well as the similar smoke trails left by the Challenger's booster rockets after the explosion.